A continuing overriding question, of course, is whether, and in what ways, partners find the sessions useful. 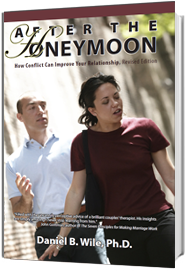 Couple therapy is an experiment to see whether the presence and interventions of a third person—in this case me—can enable partners to have better conversations than they have on their own, conversations that make a meaningful difference and bring clarity to the situation. Sometimes the answer is yes and sometimes it is no. Brent: It doesn’t surprise me. I knew she felt that way. It’s painful to hear, but there’s something relieving in having it finally said. Much of Harriet’s distress arose out of her inability to talk to Brent about her dissatisfactions. Bringing them into the open immediately reduced much of their intensity. Sometimes partners don’t want clarity. When June describes her dissatisfaction with Gene, she is shocked by what she hears herself say. She hadn’t known the depth of her unhappiness with him. Gene is devastated. He hadn’t known how little love she feels toward him and how little respect. Getting such concerns into the open was not relieving. Distressed by their recognition of the weak foundations upon which their marriage is based, each privately wonders whether they should be together. Ending the marriage is not an option. So they end the therapy in order to turn off the spigot of this undermining information. 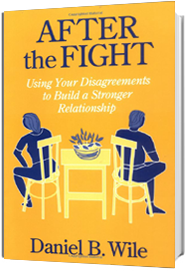 I’ve been surprised when, after a session I felt had gone poorly—the partners fought the whole time—they say at the end of the session, “This was great. We never get to talk like this at home.” I realize that my standard for what constitutes a useful conversation was too high. At home, they explain, they never get a chance to talk, or even just to fight. After three sentences one of them storms out of the room and they don’t talk for three days. In therapy, they get a chance to make their points without the other person disappearing on them. I get discouraged following sessions in which partners reject out of hand everything their partner says and everything I say. I spend time before the next session puzzling over how better to handle the situation. My preparation often turns out to be unnecessary. The previously unyielding partner returns in an entirely different mood. They might even have begun to make some of the changes for which their partner had asked. The unyielding partner had been taking in what the other partner was saying. That person just wasn’t in a frame of mind at the time to acknowledge it. Part of what makes a good therapy relationship is also what makes a good couple relationship: stepping back at important moments and examining what’s going on. I like to provide such moments throughout the session and close the session by stepping back to talk with the couple about what they got out of that session. Ah ha… I’m not alone!! Thanks for another interesting and inspiring post. I like what you wrote at the end about stepping back and examining what is going on in the session as a role model for being in any relationship. I certainly have experienced what you describe–not knowing what parts of the session have been most impactful to the clients and the need to ask. Thanks for sharing your work. Interesting and provocative as always, Dan, but I wonder what the differences there may be between a three-person and a four person session. That is, I know that you and Dorothy run not only workshops but also some sessions together. I’m sure you’ve both considered the matter but what impact does the foursome have, if any, on the dialogue of the couple and the implied dialogue of the therapists before, during, and after the sessions? Another great post, Dan. I realize now that I always ask couples for feedback at the end of my first meeting with them, but usually not later. I think I may sometimes be afraid to find out what they are thinking or that, even when I thought it was a good session, they didn’t! But, of course, you are right that therapists need to know when things are not going well (and more, as you point out in your blog), and that it’s great to model such willingness to receive feedback. I’ll be trying this more this week! Thanks. I appreciate that you are pointing out the importance of checking in with patients rather than making assumptions about how the session went, and what was useful–or not! This is such a good reminder–it’s easy for us to assume we know what is going on in the patients’ experience. This kind of intervention brings into the foreground the collaborative aspect of the therapy, and invites the couple to take more responsibility for tracking and reporting on their experience. It also invites them to reflect on and articulate for themselves and to each other what might otherwise go unsaid. This may also contribute to the assimilation of what was learned, clarified or discovered in the session. And if they have trouble articulating it, that can also be important info and grist for the mill. Also, your attitude toward critique of the session–wanting to hear what is not working as well as what is–models encouragement for the couple to do this with each other–to say the hard things that need to be said and heard. Thank you for this–I look forward to sharing these ideas with trainees and supervisees as well! 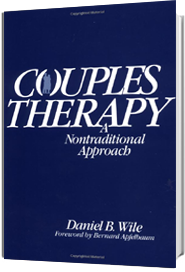 Dan, I think the key that unlocks this simple end-of-session movement (that I love) is your final paragraph–“Part of what makes a good therapy relationship is also what makes a good couple relationship.” There’s something informative here for us as counselors/therapists. But it’s more than having each person tell us what was significant during the conversation. This is always helpful to us as therapists and often delightfully surprising. Couples that come for marital work often have a relationship that is devoid of some simple (basic) elements that characterize growing, healthy marriages. Or you could even say, at certain challenging seasons of every (even growing) marriage, these elements that nourish and sustain a marriage, are ebbing. How can we (re)introduce these qualities, habits, and practices back into this couple’s daily life (starting in the counseling hour) that might qualitatively improve and cultivate unity and thoughtful care? I really don’t see this as “teaching” or “psychoeducating” the couple. We are doing it with them. They are experiencing the good of stepping back from their conversation/relationship with honest reflection, gratitude, and possibly even confession/acknowledgment. I’m so thankful for you and your team leading us in thinking well and better about helping couples. Love this. Such honest inner monologue. Very much agree that finding ways to illicit feedback about the session can be so useful. Much appreciate these suggested end-of-session questions. Hi Dan, although I am a big exponent of getting feedback at the end of sessions, I frequently “forget”. Your post is a good reminder to do it. How else can we truly know what our clients are thinking about the session except by asking! Are we mind readers? I, like you, often discover that I am totally wrong about what they like or didn’t like. Plus it is an invitation for them to get on the platform. While they may not succeed, they are being invited to reflect about the process. I remember what Yalom wrote in his group therapy book: Good therapy facilitates deep experiencing AND reflecting about the experience. As someone else mentioned, this makes the therapy truly collaborative.